Show Foot is a professional anti-slip aerosol spray that dries fast and is non-irritating. This natural rosin formula provides excellent "tack" - preventing slipping during indoor shows. It works equally well on damp grassy surfaces. 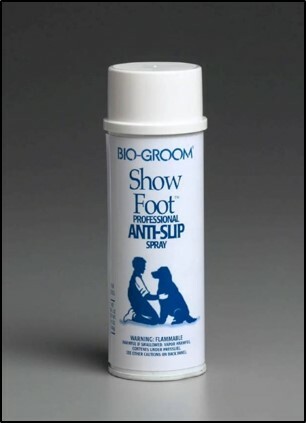 Directions: Spray Show Foot lightly on bottom of paws. Avoid spraying on the coat or in the dog's eyes. The spray wears off, but can easily be removed with Bio-Groom Mink Oil Spray, mineral oil or rubbing alcohol.